Quench very dry skin with this deeply nourishing duo. The rich, creamy formula of Skin Recovery Moisturizer instantly hydrates and soothes dry, tight-feeling skin, while protecting it from environmental attack. For extra hydration, combine it with Moisture Renewal Booster - a nourishing blend of plant oils and ceramides that replenishes dry skin and calms redness. Together, both products will restore your skin's moisture balance, leaving it soft, smooth and radiant. This is the perfect duo to use at night. Apply Moisture Renewal Oil Booster after cleansing, toning, exfoliating alone or mix it with Skin Recovery Moisturizer. The moisturizer should be the last step in your nighttime routine. If skin needs extra hydration, you can also apply the booster in the morning after cleansing, toning and exfoliating, but always follow with an SPF. 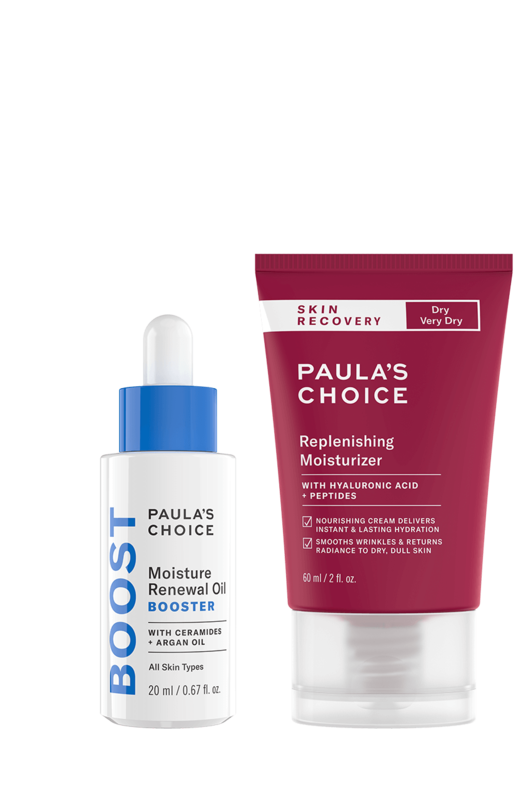 Are Moisture Renewal Oil Booster and Skin Recovery Replenishing Moisturizer suitable for rosacea-prone skin? Yes! In fact, they can actually improve symptoms of rosacea-prone skin such as redness and sensitivity. That’s because they are full of antioxidant, anti-inflammatory, and barrier-repairing ingredients that will strengthen the skin’s surface and its ability to withstand damage.